Just Host is a UK-based web hosting company boasting all-around excellent service including unlimited amounts of disk space, bandwidth, email, and hosting domains, as well as solid support with quick response times. In this review we will investigate whether or not Just Host sets itself apart in the hosting industry, or if it’s just another host. Just Host offers two hosting plans: the JustPlan and JustPlan Premium. It appears that the only difference between the two plans is the number of free domains that are offered. JustPlan offers 1 and JustPlan Premium offers 3. The $4 extra per month (when billed monthly) hardly seems to be worth the extra two free domain names (in effect paying $24/year for each of those two extra domain names). I wanted to confirm that this was the only difference between the two plans. Therefore, at about 6:30 PM one night, I initiated a chat conversation. The individual I chatted with was able to instantly concur with me that the only difference was the extra two free domain names. Just Host offers a pretty standard feature-set including Linux-based servers running Apache, with the industry-standard cPanel control panel software. For the JustPlan, they list the price available at their longest billing cycle. In order to keep the cheapest price per month, one would have to sign up for four years of hosting. So the $3.45/month turns into $7.95/month if billed monthly. Many hosts advertise the lowest price, but explain the billing cycles on their hosting pages. Just Host doesn’t disclose what the price is until a customer selects the hosting on the purchase page. Free setup is advertised, yet those selecting a monthly billing cycle will be billed a $20 setup fee. Unlike many hosts who simply offer a 30 day money-back guarantee, Just Host provides their guarantee at any time. Their policy seems very fair, as they refund the remainder of a customer’s term. Understandably, they cannot provide refunds on setup fees and domain name registrations, but they do release the domain name to the customer. They also provide other nice guarantees such as 99.9% uptime. If that is not maintained, then they are willing to credit one’s account with the cost of a full month of hosting. Just Host also offers a generous amount of free ad credits (about $150 worth at the time of writing). When I clicked to view the Just Host terms of service I was greeted by a message stating that their “terms of service are designed to be read by the average Joe” and that I could contact them if I had any questions. For perhaps the first time, I discovered terms that were actually manageable to go through, and they were nice enough to compile them into one page. Many hosts have several documents that are tens of thousands of words each, while Just Host’s are entirely described in about five thousands words; which, if printed, would be about ten pages. Through their terms of service, it is evident that Just Host is being quite fair. Unlike some hosts, there were no terms that stood out to me as being illogical or extreme. Just Host utilizes the industry-standard cPanel control panel to allow customers to manage their web hosting. When logging into the control panel I was presented with a page trying to sell me various upgrades. It was almost as if I had found myself presented with one of those interstitial ad pages, something I wouldn’t expect to find on a service I was paying for. They were legitimate, relevant offers related to their hosting, but I didn’t think it was necessary for them to try to up-sell in this way. It may be enticing to some as they state that is in “today only.” Then I clicked to go straight to my control panel and was faced with an overlay box with an offer to submit my site to search engines. I didn’t really appreciate that much marketing; yet luckily I was only faced with it the first time I logged in. cPanel includes the Fantastico library of applications that can easily be installed through its automatic installer. I was able to use this to easily install a WordPress blog within seconds on my site. The installation was just like I would get if I went through the process of manually downloading the WordPress package, uploading it to my site, and configuring the database, only a lot quicker to do. Through my testing, I also noted that Just Host offers a “Priority Support” option for $20/year that provides customers with a guaranteed 30 minute response time on emails and an assigned personal representative. This added assurance might be worth it to some, but one would hope that their standard level of service would be satisfactory enough without having to pay extra. In order to verify Just Host’s uptime guarantee, I utilized a service called Pingdom which checks a website’s availability and response time at set intervals and provides reports analyzing this data. It allows those who manage websites to effectively track the downtime of their sites from multiple locations around the world. Pingdom gives you nice looking reports displaying uptime and response time for any type of service: HTTP, FTP, Email, etc. 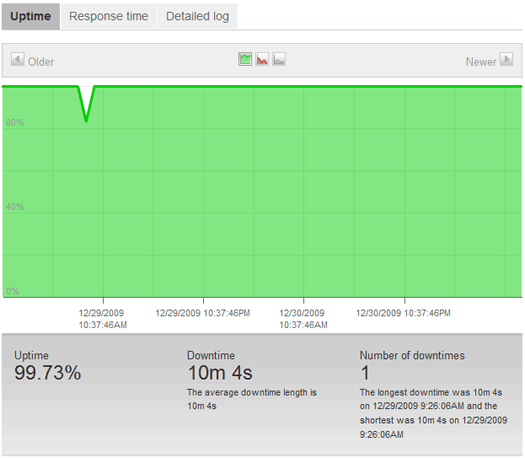 Within about the first 12 hours of monitoring, Pingdom recorded one instance of downtime: 10 minutes around 9:30 AM. The monitoring was performed at a resolution of 5 minutes, so the downtime could have lasted between five and ten minutes. During my time monitoring the service, it did seem to violate their 99.9% uptime guarantee, yet I didn’t run enough monitoring to see how the uptime was over the course of an entire month. They are willing to credit a full month’s worth of hosting, so one can imagine that downtime does not occur very often. Just Host offers a few different channels for support. Just Host support is available via live chat, a ticketing system, and the phone. They also have a knowledge base system which I found to be fairly useful. I decided to test all three. I first submitted a ticket acting like I was new to web hosting and wondering what the easiest way to track website statistics is. The ticket form stated that the average response time was 18 minutes. I submitted a ticket at 11:22 PM EST. At 11:50 PM (28 minutes later) I received a reply indicating an application that I could use (Awstats) and how to access it within cPanel. I then wanted to know what the best way to maintain my own backups would be. I therefore initiated a live chat conversation to test out that medium of support. I started at position two in the chat queue. Within a few minutes, I was chatting with a representative. The representative responded with a couple of minutes mentioning a Daily Back Up solution that costs $19.95 per year. I then asked if there were any other solutions, as I know there are functions built-in to cPanel for website backup. I then received a response a minute later requesting that I please wait while the representative researched the information for me. A few minutes later I received a response with a link to a video in their tutorial series demonstrating the backup features available through cPanel. I then asked the chat representative where he was based and he informed me that he was in Chicago. Then I decided to test out their phone support. It took me a couple of minutes to find their phone number (see why below). I had to search for it in their knowledge base system. So then at about 5 PM on a weekday I called their general phone number. This time I was going to ask about preventing others from stealing images by directly linking to them (hotlinking). When calling Just Host customer support, I was presented with clear phone options. After selecting the third option for support, I waited for a few minutes as I listened to xylophonic music and a periodic voice reminding me that my call was very important to them (with intervals of about 45 seconds). After six minutes of this, a representative answered the call. I presented my question and the representative understood what I wanted without hesitation. Unlike other hosts, he did not request my name and domain name before assisting me. This was helpful to save time with my general question. The individual did seem to have a rather thick accent, and this may be evidence of outsourced phone support, yet I was able to sufficiently understand his English; although, I can understand that some individuals may not have been able to. At the end of my first month of hosting I received an email indicating that my account would be suspended if I did not pay it soon. I therefore paid it, but discovered that their system automatically charged me for it. I learned I had been double-billed. I contacted their billing department and I received a reply within 20 minutes indicating that I had been refunded for the extra payment. I was pretty satisfied with that. One thing I noticed after searching for their phone number on the site was that it was at the top of the site originally, and then after I logged in as a customer this was replaced with a live chat link (they use a cookie to track this). I found this to be very interesting as I had never seen such a tactic before. I’m not sure if it is for a marketing purpose having customers sign up thinking phone support is readily accessible only to be presented with live chat later, or if they simply prefer that customers use the live chat functionality. I chatted with a live chat representative regarding this issue; they were willing to provide the number, but they were not able to provide a conclusive answer as to why this was. 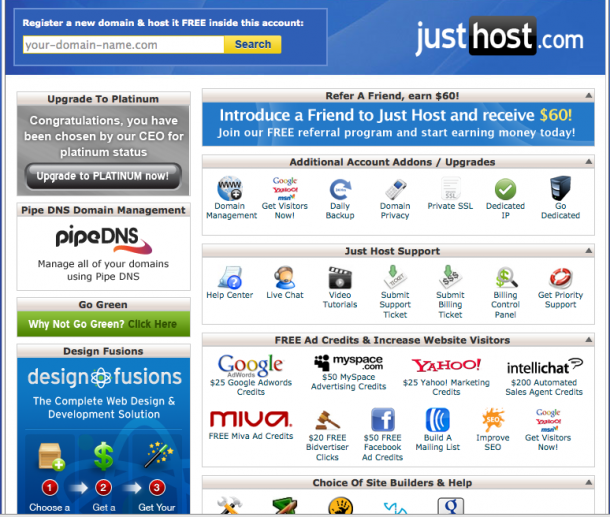 Just Host is a reliable web hosting company providing good service with fast-responding support. They are backed by uptime guarantees and the freedom to cancel at anytime and be refunded for unused hosting. Their pricing is very competitive, especially when signing up for long-term billing cycles. The only thing that I didn’t like was the extent of marketing for upgrades and extra services throughout the site. This can easily be annoying to some individuals. It also would have been nice if they had phone support that did not seem outsourced. One more thing: as I was reading along the bottom of the page, I discovered a link called “(Secret Link)” that provides a 20% discount on the first term of hosting for those who find it. I went with Justhost starting a new online business. I liked the “unlimited-ness” in the hosting plans and paid for 2 years upfront (unlimited plan 50%off @ $70.80/year). I was also automatically opted in for their domain privacy option (@ $9.95/year) because of my inexperience and reading their terrifying description of the consequences of not having this option. Then I realized my site, with very limited traffic, was quite slow in loading. When I contacted customer support, they responded in about an hour with a marketing ad for their upgrade to a faster server. I was suckered in @ $23.64/year). I then went to a dedicated IP (@$19.95/year) to attempt to use their shared SSL certificate to secure login to my website (as req’d by Google Adwords). Could never get customer support to help me set this us. My site had went down several times with all services including email going offline. When contacting customer support, their average response time was more like 1-2 hrs and took several communications to have them finally identify the problem and correct it. I finally discovered that the problem was definitely on their end by them constantly swapping me to a shared IP address. My “Fast Server” option also cost me several days of down time when unknown errors would occur in the transfers on their end. When I commented on the down time and the time consumed waiting for support, they simply tried to sell me “Priority Support” (@$19.95/year) for guaranteed 30 minutes responses. Recently I tried to upgrade to their issuance (through a 3rd party) of a Private SSL Certificate, I noticed that I was back to a shared IP address. I finally got their support to recognize this in only 1 email that took 2 hours to be replied to. They promptly swapped me back to the a dedicated IP address which took my site down another 4-6 hours while DNS servers updated. When I inquired about how long my site was not getting the upgrade that was paid for, they responded that upgrades are not pro-rated not eligible for any refund. They would not tell me how long my site had been back on shared IP address (over 4 months) stating that they had no way to track this. The final straw was when I was still attempting to purchase a private SSL through them ($69.99/year) and the account upgrade process would not submit. 4 hours lated a customer support email was sent to me advertising the service that I was unable to access. They sent me a link to the upgrade page, but once again, the page hung on a blank page after attempting to purchase the upgrade. When I replied back, they sent me an advertisement for priority support that might be better able to assist me. So in price comparisons, for the same services that I would get at other hosting companies for $15/month or $124/year (based on hostgator’s highest business plan with 20% coupon), I would have to pay $214.28 / year. Doing the math, Justhost was no bargain at all and for the premiums being paid, their support was idiotic. $ 9.95 – Domain Privacy. $19.95 – Dedicated IP address. $69.99 – Private SSL Certificate. I don’t know which hosting company (hostgator was simply one that I am researching) I will swap to but I sure hope that I at least get what I pay for with some type of concerned customer support and a more straight-forward pricing plan. Stay away from these numnuts! I had them for a short while. They constantly want you to upgrade to this or that. Bombarded with ads when you login to Cpanel! Thats nuts! I actually emailed them about that, but was told you can’t disable the messages. And theyre support gets bounced around to different agents everytime. Who dont read what the original message was. It will be a miracle if i can find a hosting company with good cust support.